Manheim Baltimore-Washington helped clients knock sales out of the park at the third annual ‘Summer Slam’ sale Tuesday, July 18, 2017. This year's event featured more inventory, more buyers and more transactions than last year. Some 3,000 units were available at the baseball-themed event which brought more than 2,000 buyers contributing to an overall sales rate of more than 60 percent. From hot dogs and Cracker Jack® caramel popcorn to an ice cream cart, each lane offered a fun baseball themed item for dealers to enjoy while they browsed and bid for inventory. The first 200 dealers in-lane scored a free gift – and one lucky person won tickets to Baltimore Orioles games! 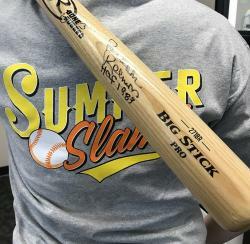 Participants even had a chance to win an official Hall of Fame signature bat featuring Orioles legend and Hall of Famer Brooks Robinson. New to this year's event was a Drive Ready sale geared toward dealers looking to purchase low-mileage, newer model year vehicles that are nearly ready to go to the retail lot. Manheim Baltimore-Washington is a sprawling 300-acres location with 17 auction lanes and it is located approximately 15 minutes from the Baltimore-Washington International Airport in the city of Elkridge.